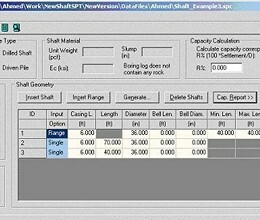 The FB-Deep computer program is a Windows based program used to estimate the static axial capacity of drilled shafts and driven piles. The drilled shaft methodology is based upon Federal Highway Administration reports. 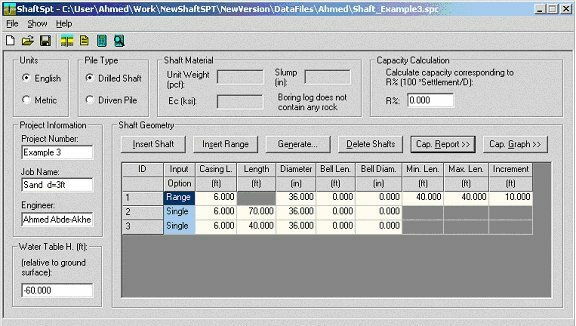 Driven pile methodology utilizes two types of analyses: SPT and CPT. SPT methodology is based on empirical correlations between cone penetrometer tests and standard penetration tests for typical Florida soil types. Unit end bearing resistance and unit skin friction resistance versus SPT N values are given in the FDOT research bulletin RB-121, for the different soil types. Driven pile capacity calculated using CPT data can be determined by three separate methods. The first method is the Schmertmann method proposed by Schmertmann in 1978 (AASHTO LRFD Bridge Design Manual). The second method is the LCPC method proposed by Bustamante and Gianeselli for the French Highway Department in 1982. The third method is the UF method proposed by Bloomquist, McVay and Hu for the FDOT in 2007. This download is a demo version. Demo version has the file save feature disabled. Note: The Demo version can not be used to update a licensed version. * FB-Deep download link provides demo version of the software. No one has rated FB-Deep yet. Be the first to rate this product.